This morning, we decided to get outdoors early in an attempt to beat the heat. 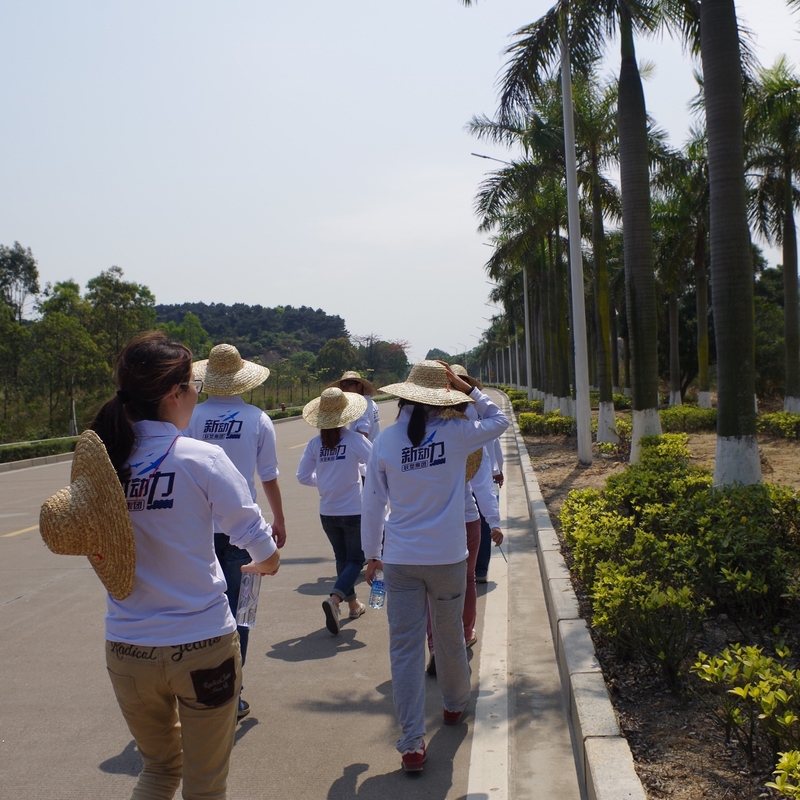 We had a lovely morning on Qiao Island, but if the truth must be told, I think the heat beat us. The high today was 92*F and the heat index got up to 115*F. Good thing we went out early. 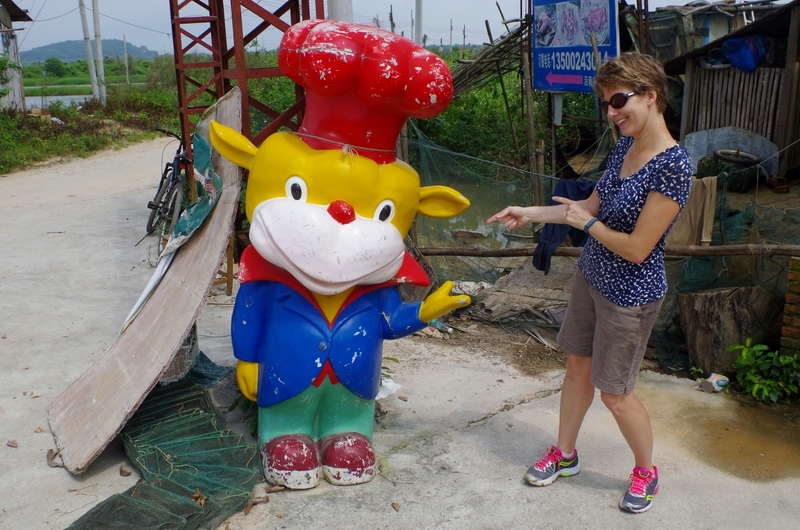 We took the #85 bus from Tangjia onto Qiao Island and hopped off by a roadside bike rental stand. 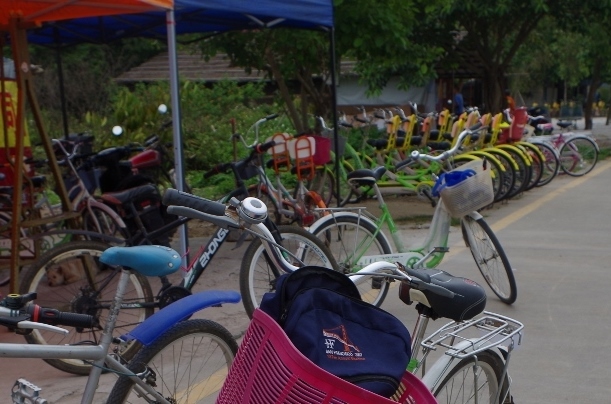 The sign by the road says bikes are 10 yuan for a day. The woman at the shop insisted they were 15. Perhaps they cost extra because Joel’s was a mountain bike (multiple gears, oooh) and mine had a child seat. Or maybe they were extra because we’re foreigners. Whatever the case, we made our payment and were pedaling by 9:00. 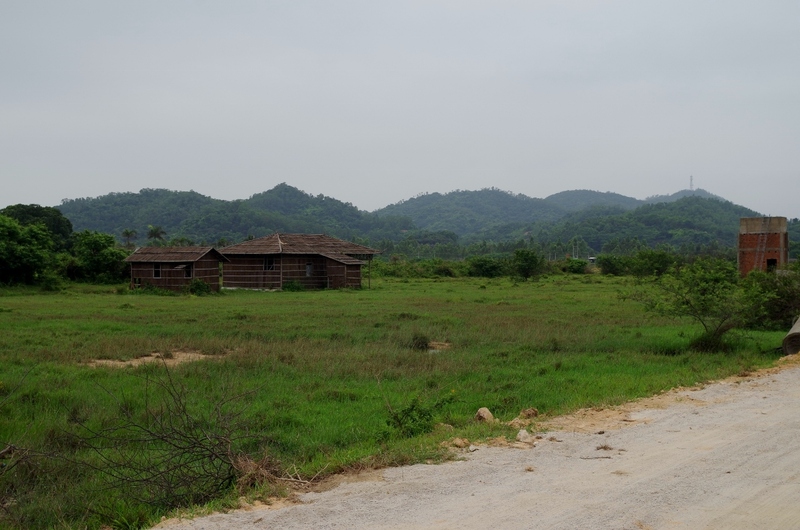 Qiao Island is still quite undeveloped. 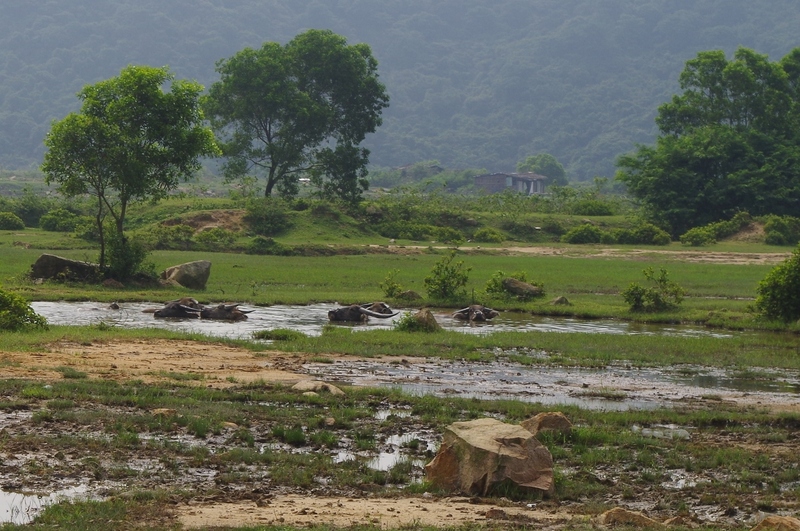 There are lots of wetlands, fish farms, and patchy little farms with shacks nearby. Are the shacks living quarters? Or just a shady spot for workers to hide from the heat? I don’t know. Our path started out paved but turned to a dirt road soon enough. Dirt. Mud. Whatever. The path we chose went up a steep hill. We gamely tried to pedal it, but it was no use. We wound up pushing our bikes most of the way up, only to ride down the other side at white-knuckled speed with brakes that don’t really work. Oh yeah, and I’ve got a kidster with no helmet on the back of my bike. No biggie. 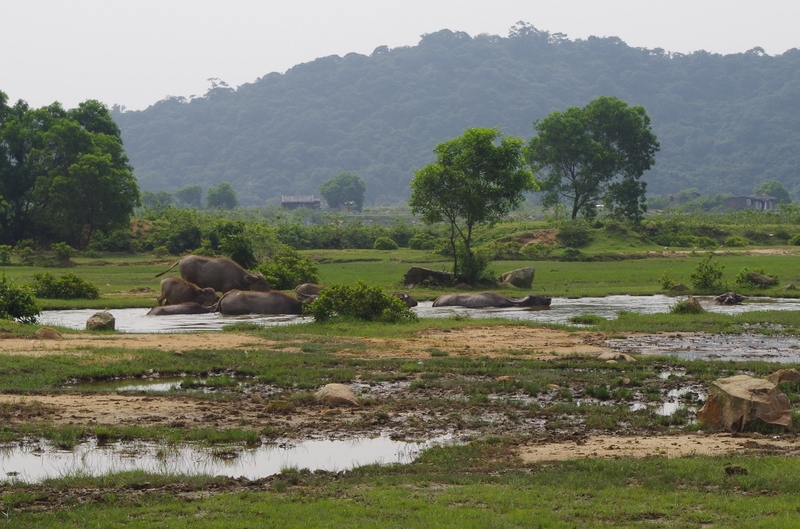 After a while, we came upon a big pasture with water buffalo in it. 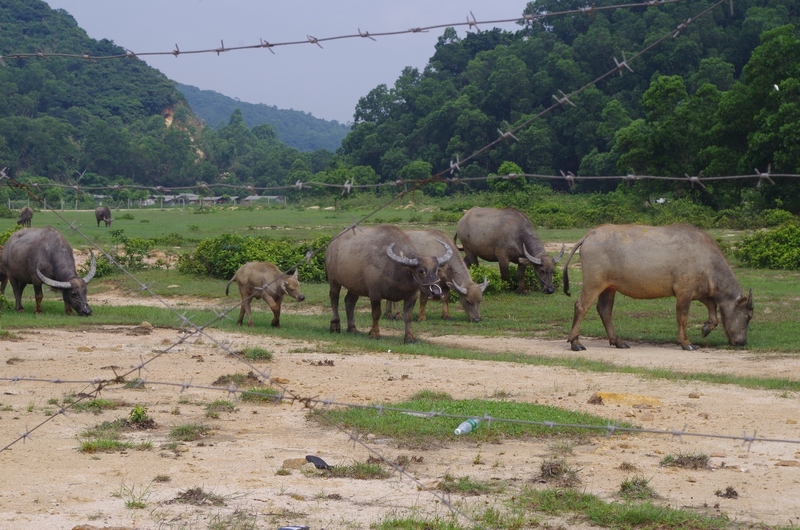 I confess, these are the first water buffalo I’ve seen in China. On previous visits to Qiao, we’d noticed other signs of their presence, but this was the first I’d caught glimpse of them. They’re big and their horns are quite impressive. I remarked to Joel that I was quite happy to have a tall barbed wire fence between me and them. We paused for a photo break and to let Simon “oooh” and “wow” at the hoofstock. We started pedaling again. The buffalo were walking at the same pace as us, just on the other side of the fence. And then, all of a sudden, they stepped through a hole in the fence and wandered right into our path. Oops. So much for the security of barbed wire! Fortunately, they weren’t interested in us. The lead buffalo had his sight set on a pond on the opposite side of the road. In they climbed, one by one, until nothing was visible but a bunch of heads and horns. They don’t call us “water buffalo” for nothing. 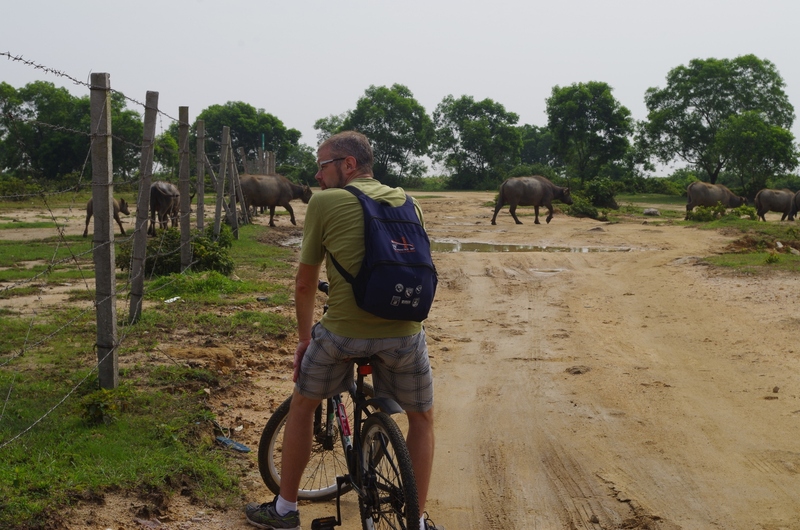 Had we bicycled by just ten minutes later, we might have crossed right by that pool without ever even noticing the dozen buffalo chilling within! We turned back, as I was still a little nervous about the general proximity. 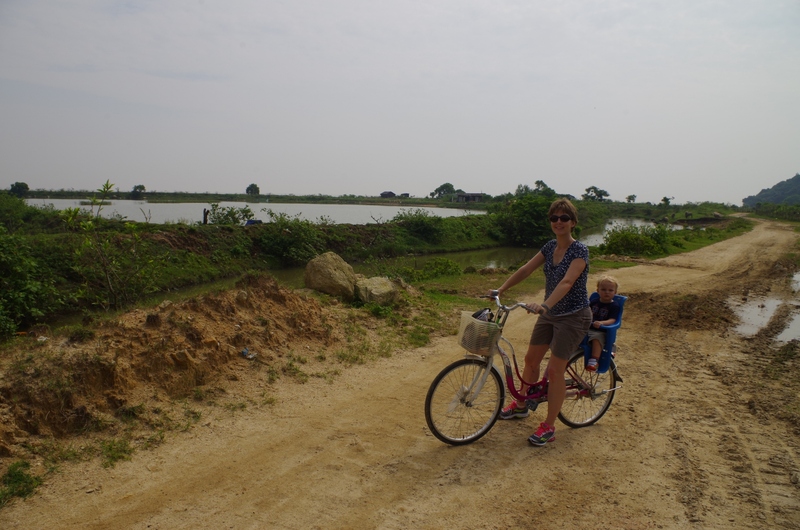 Perhaps if I didn’t have Simon, or the roads were solid enough that I could have pedaled faster, I’d have felt more comfortable. 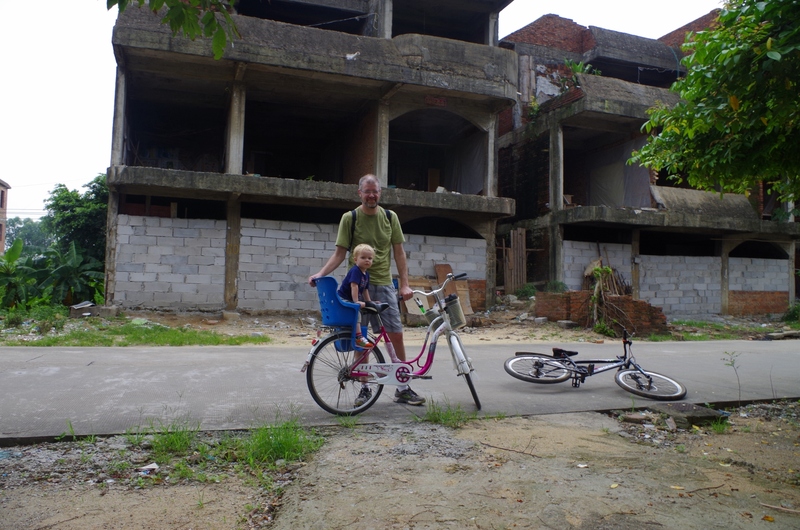 We biked back into Qiao Village. A lot of the homes here are in rough shape. Actually, to be blunt, they look like they’ve been bombed out. I wish I knew what was going on. 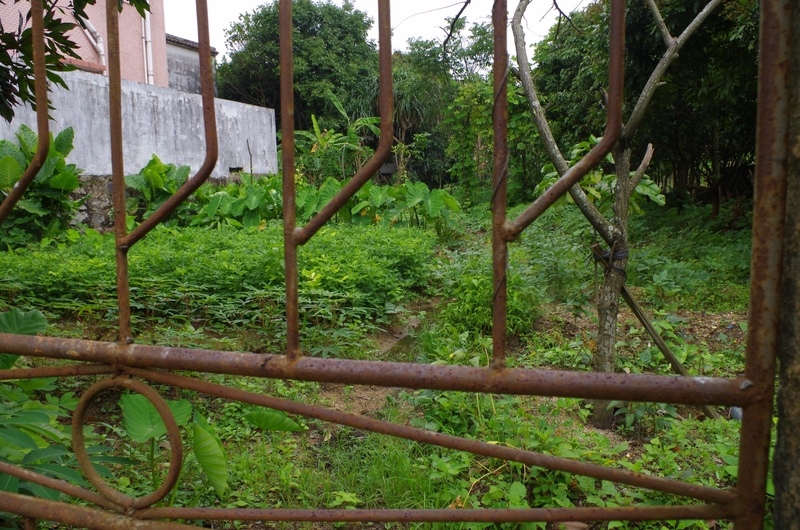 And yet despite the generally dilapidated, abandoned feel of the neighborhoods, there are tidy, healthy vegetable gardens in many of the courtyards. Somebody still lives here, and they have green thumbs. Peas, corn, bananas, and more. We were hot and tired. Simon wasn’t the only one who needed a nap. We returned our bikes and hopped on a bus home; back by noon. We were thirsty, hungry, and very, very sweaty–and we’d earned our right to laze about in the air conditioning for the rest of the hot afternoon. 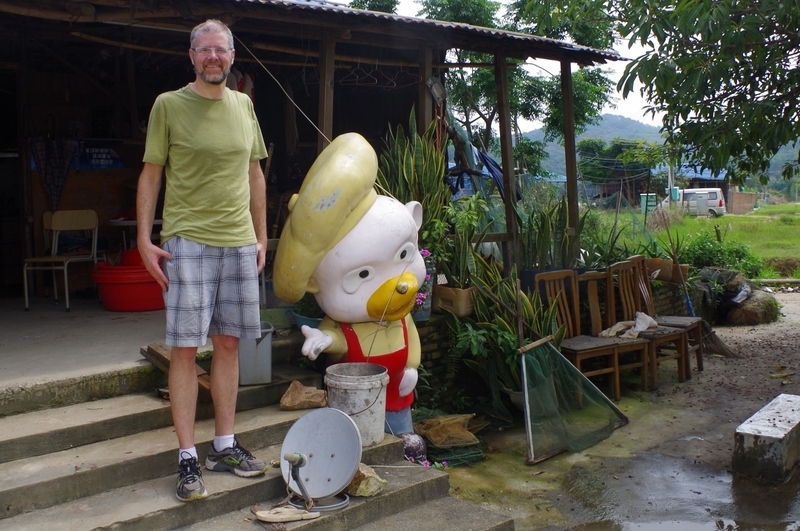 A sleepy fishing village, a public serenade, and a scavenger hunt à la “Amazing Race.” On Monday, Joel and I visited Qiao Island. When the weather is clear (and it finally is, hurrah! 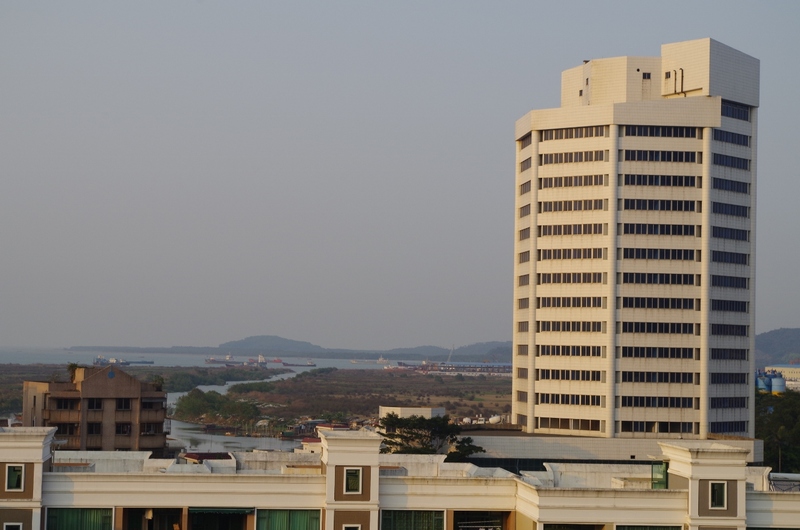 ), you can see Qiao Island from our balcony. View from our balcony, with Qiao Island in the background. A short bus ride (#85) got us there and we decided to hop off at Qiao Village to walk around. 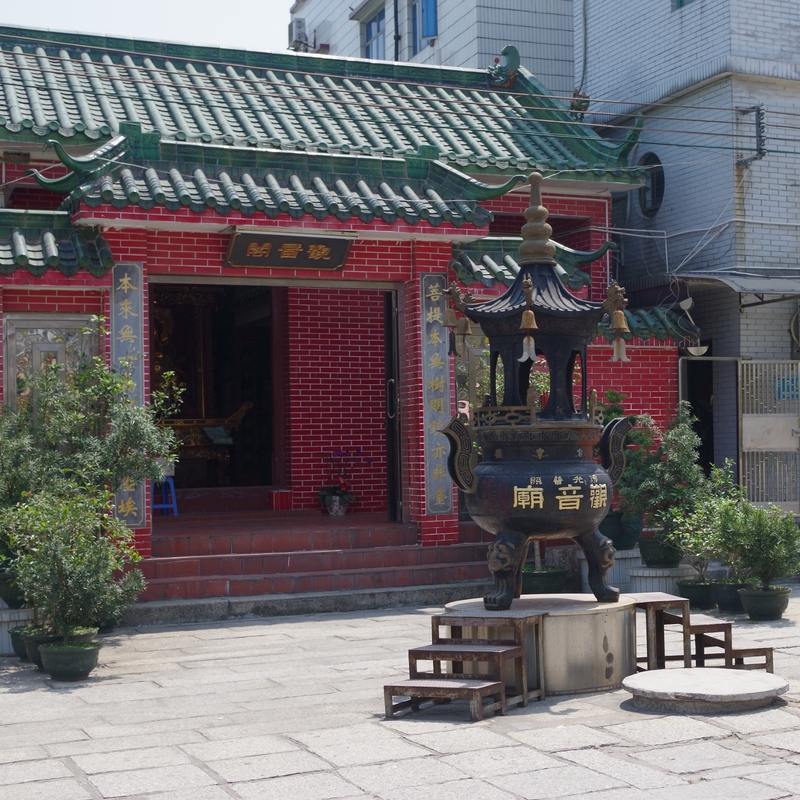 There are a couple of small temples (very quiet–we were the only people in one) and narrow, stone paths through the old neighborhoods. Some of the homes are 200 years old. 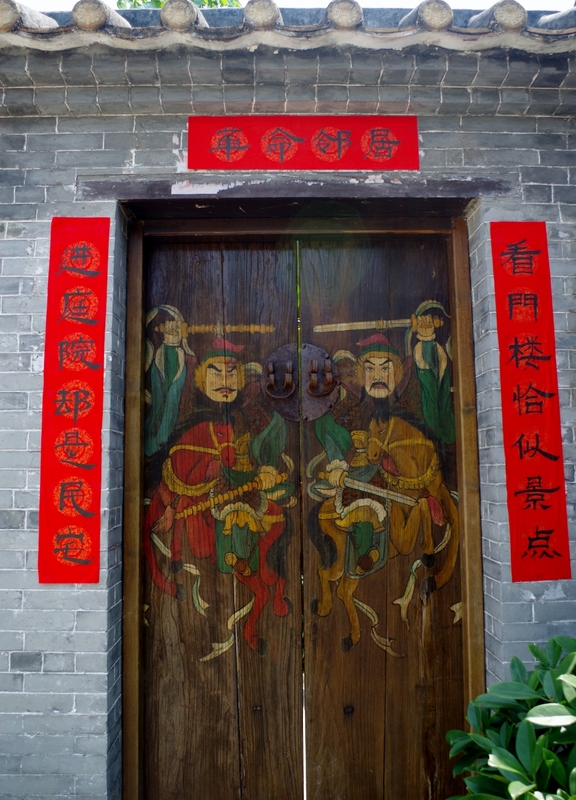 Beautiful, restored doors to an old building in Qiao Village. Narrow roads of Qiao Village. The big attraction in town is White Stone Path, which seems strikingly out of place in an otherwise sleepy village. 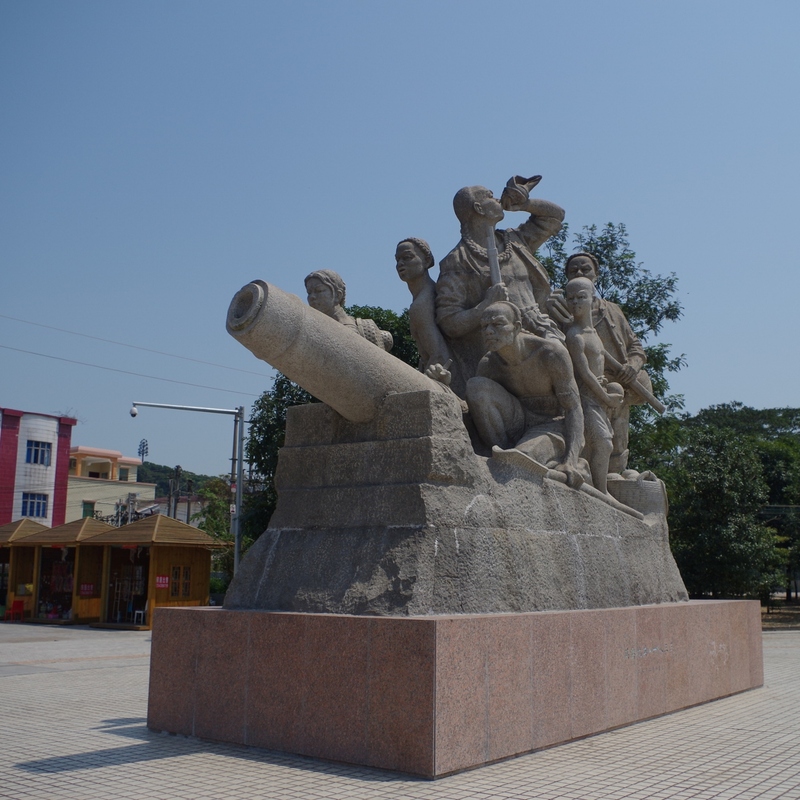 During the Opium Wars, the local islanders managed to fend off attacking British troops by using a strategically placed cannon. (I think. The history here is a little murky since I can’t read Chinese.) Using compensation from this victory, the triumphant islanders were able to build this stone pathway and monument to the battle’s martyrs. Small temple on White Stone Path. 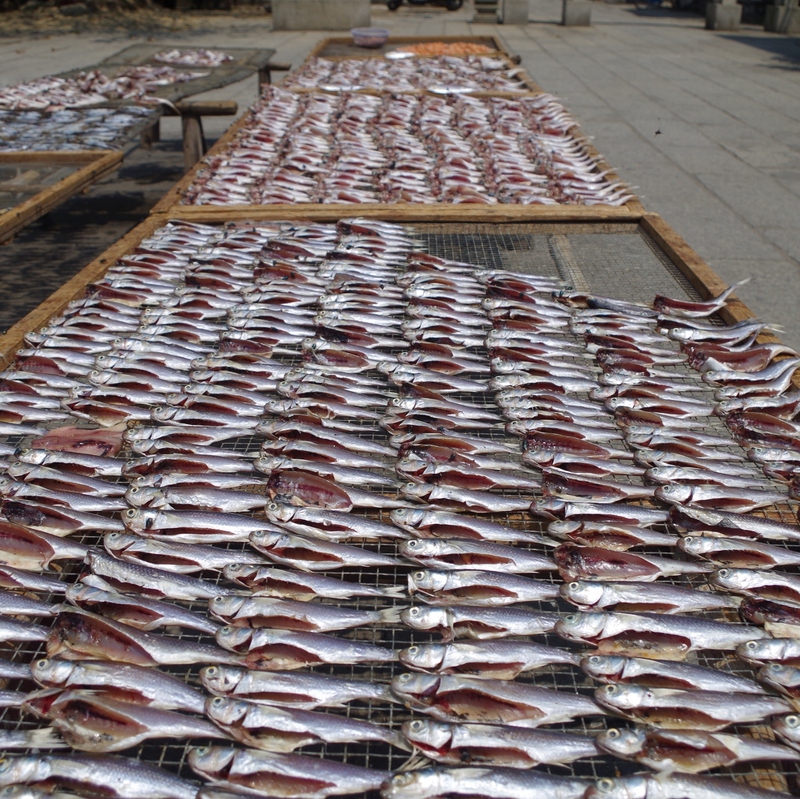 There were a couple of fishermen drying their catch in the plaza. Joel and I meandered through the drying screens to see what we could recognize. 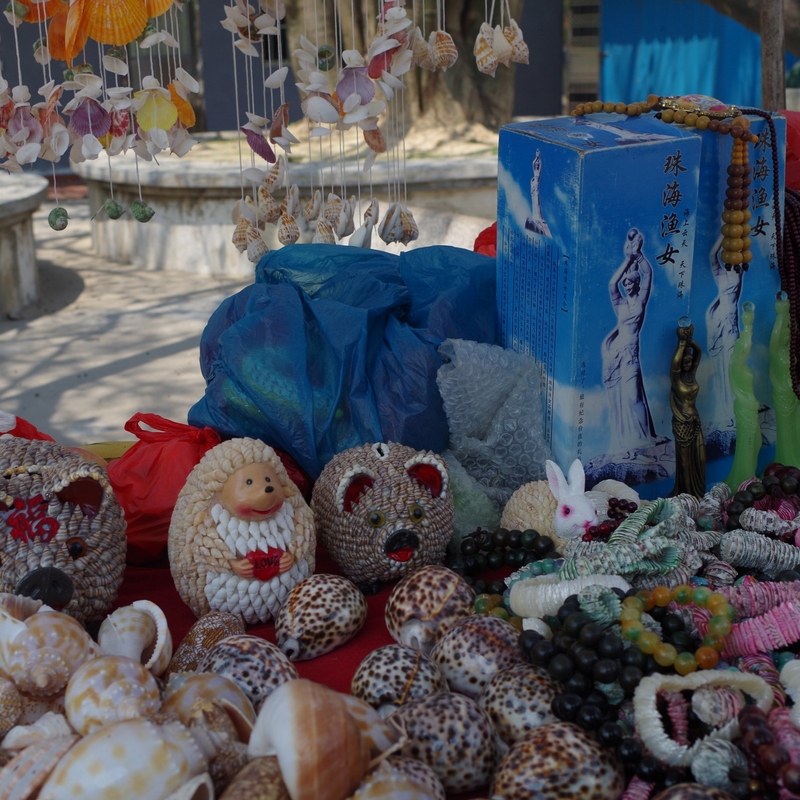 There were also some small stands full of souvenirs, clearly targeting domestic tourists. There weren’t too many people out on this day, but I imagine it becomes a busy destination once summer arrives. It’s a hedgehog made out of seashells. At about this point, Joel and I were feeling lost. We were hungry but hadn’t found any promising restaurants. There were supposed to be beachside seafood restaurants, but we’d gone the wrong direction. There’s a protected mangrove forest, but we didn’t know how to find it. 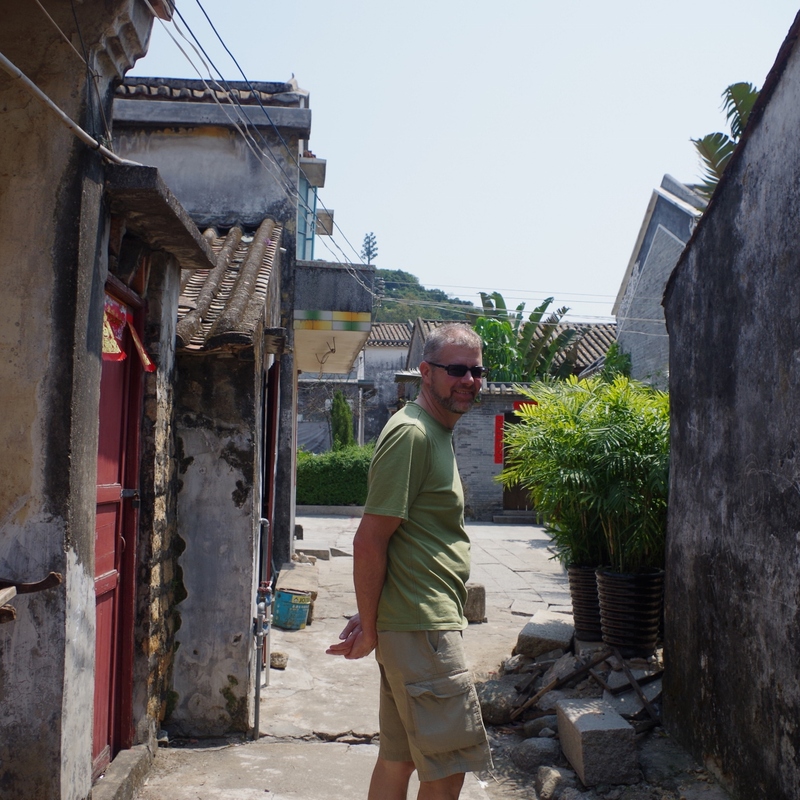 None of guidebooks mention Qiao, and our phones had poor reception on the island. We were wandering a bit aimlessly down the narrow streets. Suddenly, from a side street, a young Chinese woman (20-ish) called to us in English and caught up to us. Behind her came another dozen college-aged students, all wearing matching polo shirts and straw hats. Uh-huh. This was getting suspicious, fast. Why did they need money? Why is this my problem? I steeled myself. How much money? There was much chattering among the group and some calculation. “Twenty kwai…maybe 30?,” the leader asked hesitantly. (That’s a little less than US$5.) Ok…. There, on the narrow old streets of Qiao Village, we were serenaded by a group of Chinese college students. A few were shy but soon joined in. 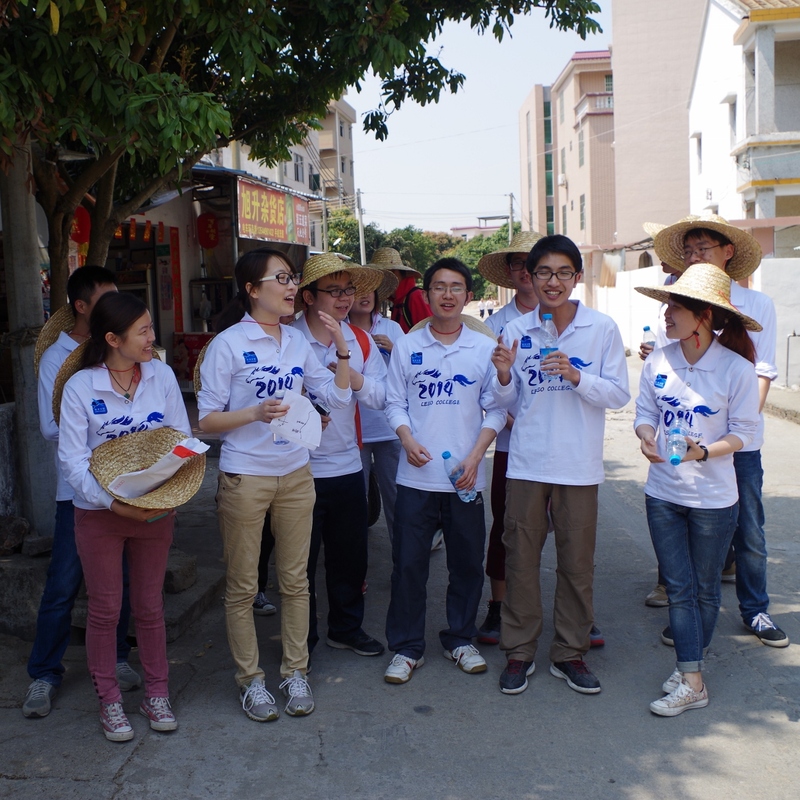 A couple used their water bottles as “microphones.” In turn, we gave them 30 yuan. They cheered. Someone hugged me. Lots of thank-yous were offered. They were now headed to a famous historical site and offered that we could come along. Why not? We had no place to go, and they offered to translate once we got there. So we set off walking with this group of students and I learned a bit more. They are all graduating from college soon and have been hired by a Chinese company. This is a team-building exercise for all new hires. 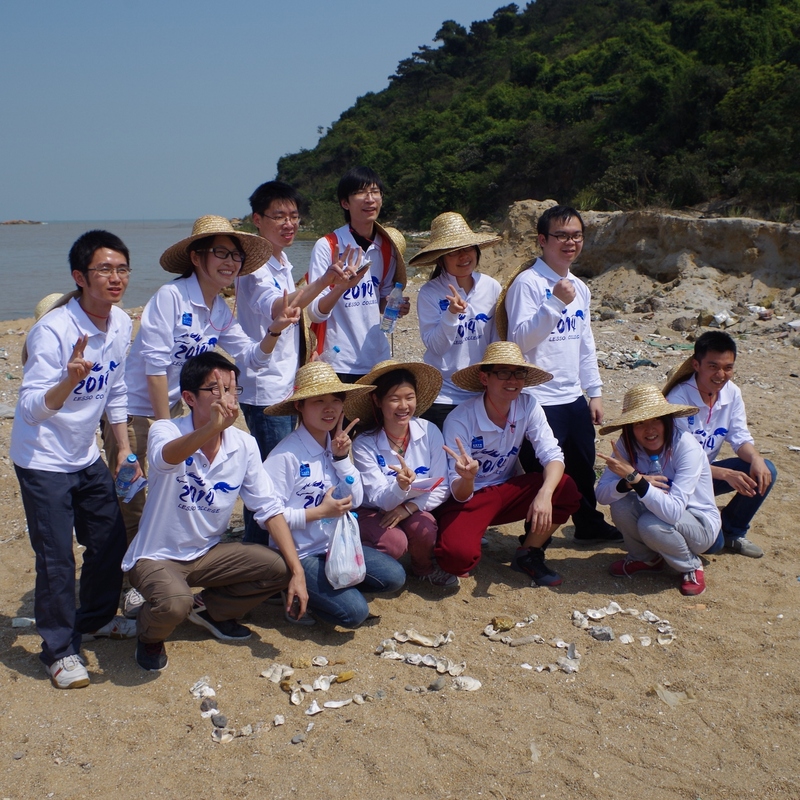 They were one of four teams on Qiao today, competing in a scavenger hunt. “Our name means ‘To Conquer'” said the group leader, “but we lost both of our challenges yesterday.” No worries, said others, today was their lucky day. They had us to help them, now. We mentioned that we had been unsuccessful in finding lunch. “Are you hungry? Thirsty?” One young man reached into his backpack and offered us two boxes of soymilk. We accompanied them to the historic marker while helping with another challenge: thinking of items on the island that start with each letter of the English alphabet. They were stuck on Y. Joel suggested “yield sign.” I suggested “youth.” But they had to bring a physical item back–another fellow’s backpack was filled with the rest of the alphabet. We finally settled on “yogurt”–they’d pick it up at a market later, with the change from the bus fare. 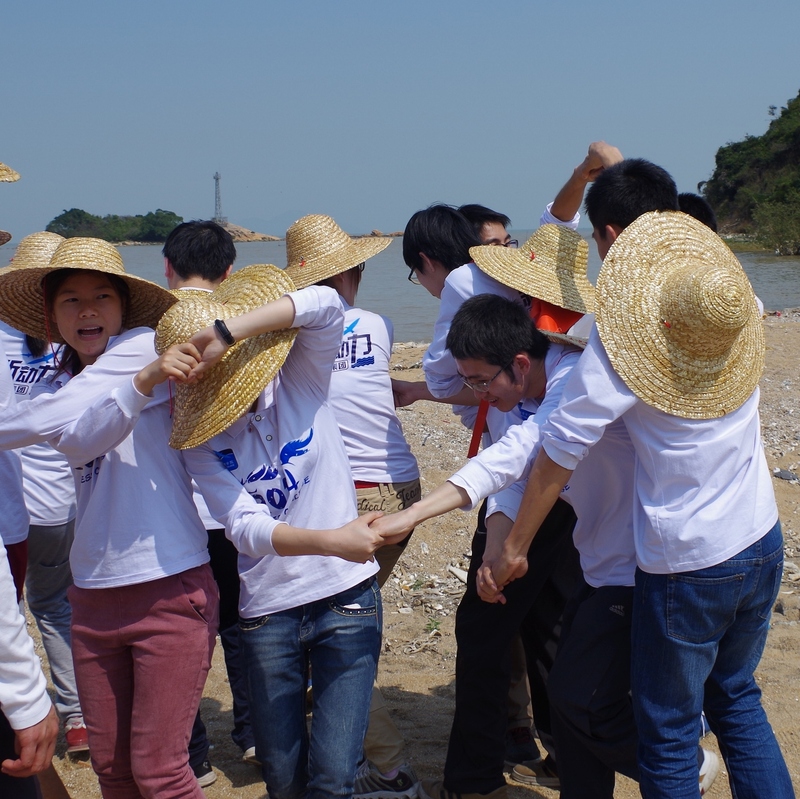 After the historic site, they went to the beach, where the challenge was to use rocks to spell out their company’s logo in the sand. There were still more challenges to go, and time was running out. They needed to save their bus fare for the last leg of the race, so the group decided to attempt a mass hitchhiking once we made it back to the main road. 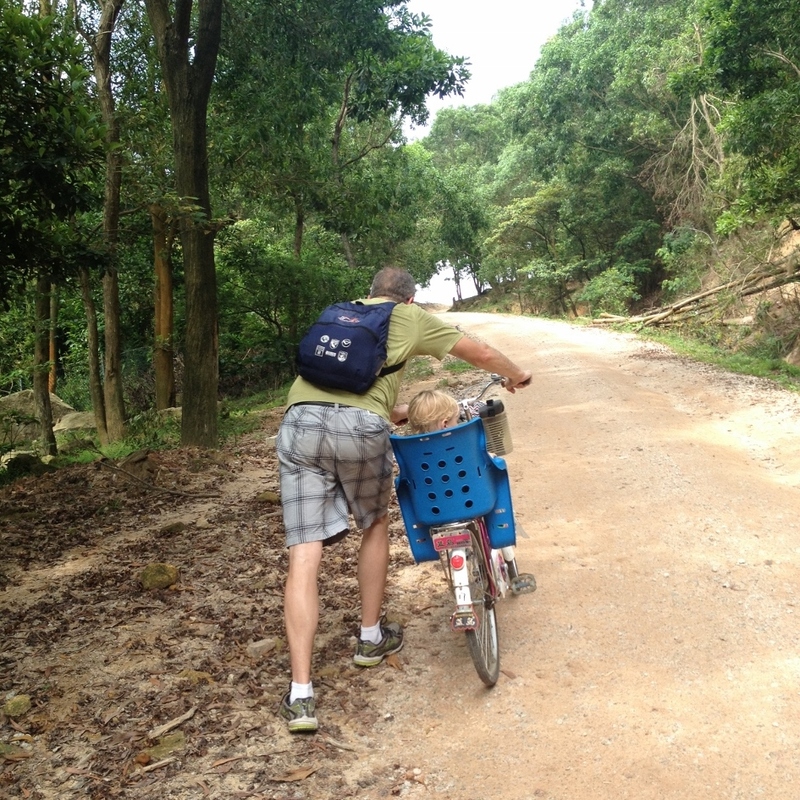 Joel and I wished them well and headed back to Qiao Village. There were more cheers and more thank-yous and a promise to connect via e-mail or WeChat. I’m hoping that “To Conquer” lived up to their name for the day. It sure made for a memorable afternoon for us. I’m starting to learn: there’s no such thing as “a typical day” for us in China. The interns head off towards their next adventure.